I had a great time! The building is beautiful, the staff extremely nice and it‘s pretty well located, too - not directly in the city (20min with the metro) and near the Vesuvio and Pompei. Very delicious pizza place just across the street. Definitely the best hostel I‘ve stayed in during my trip! Like the name says, a very happy place. A very good hostel with all what you need and perfect for meeting nice people. 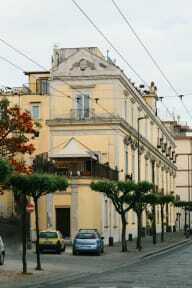 The location is also nice, near to Vesuvio and to the train station. I felt very well here and would allways come back. Special thanks to Claudio who was very helpful. Liebe Reisende, ich kann euch allen nur wärmstens empfehlen, bei Claudio zu buchen. Seine Freundlichkeit und sein Vertrauen sind unübertrefflich und ich war um diesen Preis in keinem besseren Hostel. Die Location ist genial, etwas außerhalb von Neapel hat man die Möglichkeiten, nach Pompei, auf den Vesuv oder gar noch weiter in den Süden zu fahren und die Umgebung zu erkunden. Die Terrasse ist ein Traum und auch die Bar/der Kühlschrank sind immer sehr gut ausgestattet. Danke für alles! Excellent place! The staff really know how to host and how to create conditions which make people connect. I arrived much to late (due to crazy public transport) and Claudio helped me a lot by checking me in even though I was so late. Especially for solo-travellers it's a superb place. All the rooms have spacious lockers and Air Condition! There's also excellent espresso in the mornings! Just happens very rarely that hostels have such a unique vibe! 10/10! Wonderful Hostel, cool people and the staff is so nice :-) I really love the hostel and will visit it the next time in Neapel! Hostello Felice was by Far one of the best Hostels I've ever went. The atmospehere there is just like a dream. You arrive and Claudio treats you directly like a friend. Everything there was just heartwarming. I met a lot of people there and almost every single one, I can call a friend now. My favorite Spot by far was the balcony with some cozy sofas, lights, so damn much flowers and a unforgettable view. THANK YOU CLAUDIO FOR EVERYTHING! We're going definetly to come back. Very very beautiful Hostel with a very good service and friendly staff. Nice rooms, a kitchen with a fridge, a bar and a beautiful terrace with a nice view of Napoli and the sea. We could even the the sun going down above the sea from the small balcony in our room;) Only annoying thing was the loud street... They also had nice breakfast for one euro and towels for free. From Ercolano it's easy to reach Napoli and Pomeii. We really enjoyed our stay here! Sehr schöne Dachterrasse, nette Mitarbeiter, Betten für den Preis sehr gut, Toiletten könnten etwas komfortabler sein aber an sich sehr zu empfehlen, wenn man nicht direkt in Neapel sein möchte. Bis zur Bahn 10-15 min. zu Fuß, was total OK ist.